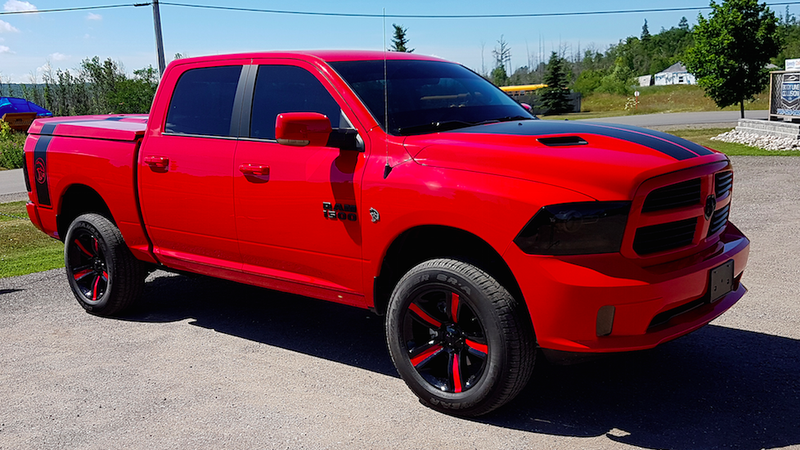 One Canadian Chrysler dealer had dream: to cram a 6.2-liter supercharged Hellcat V8 into a Ram 1500 pickup truck. Yes, that’s 707 horsepower sent to a solid rear axle on something that isn’t a drag car. I have just one word for this dealer: hero. And apparently Midland Chrysler of Midland, Ontario agrees, because this past winter, they decided to build a Hellcat Ram, and now, after months of wrenching by their main tech, Kevin, it looks like they’ve done it. After purchasing the Hellcat motor from a performance dealer in California, the dealership began tearing apart the 5.7-liter HEMI-powered Ram so they could make room for the big gun. But, of course, the gutted engine bay wasn’t enough space, so the shop had to install a three-inch body lift to fit the Hellcat’s blower under the hood. Midland Chrysler’s representative told me over the phone that replacing the 5.7-liter HEMI with the Hellcat was actually more straightforward than you’d think, in part because the blocks are similar, and also because the Ram’s transmission is essentially the same as the one bolted to the Charger and Challenger Hellcat models. In the end, the result was a Hellcat Ram that not only runs and drives, but whose AC and four wheel-drive work flawlessly. The build is going to cost the buyer $90,000, and that doesn’t include the price of the truck. But he won’t be able to take delivery right away, as Midland Chrysler says it still has to take the beast out to the track to make sure the gearing is right and the stock driveshaft and transfer-case can handle all that power. Should Chrysler Make A 707 Horsepower Ram SRT Hellcat Truck? 2010 Ram SRT-10 Caught At The Track?